Obwohl ich kein Fan von so altem Swing bin, muss ich sagen, Westlife haben das viel besser als Robbie Williams und co. gemacht!!!!! Hoffentlich ist das nächste Album aber wieder ein "normales" Pop-Westlife-Album!!! No es su estilo y es un experimento que resultó a medias. <br>¡Vuelvan al pop! Nein, ihr dürft nicht frank (Sinatra) und frei sein. 3 minus. Horrendous group on the whole and an awful covers album.<br><br>6th UK top 10 album. 14 weeks in the UK top 100. <br><br>4 weeks UK top 10. UK#3.<br>Scotland#3.<br>7 weeks Irish top 10. Ireland#2.<br><br>1 week Euro top 10. European Hot 100#6.<br><br>Taiwan#5.<br>Japan#67. <br><br>1 week top 20. 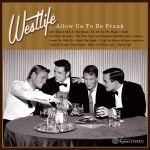 World Chart#19.<br><br>717,000 copies sold in the UK.<br><br>The biggest selling boyband album of 2004 in the UK. Ein Album mit Rat-Pack-Covers und das gar nicht mal schlecht.<br>Nur das dämliche Wortspiel im Albumtitel stört wirklich. Nett - aber Robbie-Baby konnte es besser. Nur ganz knapp die 4 verfehlt.